In its tenth installment, the yearly Desert Bus for Hope charity event has once again raised a record amount of money for Child's Play. 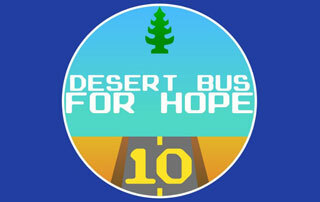 Desert Bus for Hope was really the first video game marathon for charity. Started in 2007 by the folks at LoadingReadyRun, it had raised over $3 million over its first nine years. All that money goes to Child's Play, the charity started by Penny Arcade to benefits children's hospitals around the world. It consists of LRR team members playing Desert Bus, a mini-game that was planned as part of the never-released Penn & Teller's Smoke and Mirrors. Often mentioned as one of the worst games of all time, it tasks players to drive an unreliable bus back and forth from Tuscon, AZ to Las vegas, NV. The event keeps running as long as donations are coming in, although the amount need to add another hour to the stream goes up by 7 percent each hour. That means you need more and more money coming in to keep the bus going. Last week (and into the weekend), the tenth annual Desert Bus for Hope was held, and once again, a record amount of money was raised. The event received $683,720 in donations in 2015. That figure may have seemed a lofty goal, but the LRR team surpassed it, raising $694,033.29. While raising that astronomical figure, the bus drivers combined to cover 7,155 miles of continuous driving over six days and 15 hours. That's almost enough mileage to take you from Los Angeles to Sydney, Australia. Of course, you could fly to Sydney. You wouldn't have to undertake the journey in a rattletrap of a bus with bad steering and a top speed of 45 miles an hour. Desert Bus for Hope will certainly be back next year. For now, you can see more about the event on its official site, and you can see highlights from the nearly week-long stream at the event's YouTube channel.